The past couple of semesters, I’ve taught a graduate class on theories of behavior change in nutrition and public health promotion. (Talk about a mouthful of a course name, right?!) One of my favorite theories we cover in this class is one called Self Determination Theory. I like it because in many fields, health promotion most definitely among them, we spend a lot of time thinking about what people are doing wrong and trying to figure out how we can convince them to do what we think is best for them based on what we (the experts, that is) think is important. And, when you spend a whole lot of energy focusing on the many things people aren’t doing or don’t really want to do, it’s easy to forget that people are also capable of amazing joy, creativity, curiosity, and completely intrinsic motivation. Self Determination Theory is exactly about that. About where people’s motivation comes from and how the more they can connect a behavior with things that intrinsically motivate them, the more they will internalize that behavior, and the more likely they are to keep doing it. Each of us has our own set of activities we find intrinsically motivating. For some it is dance, for others it is building furniture. You may love math, or writing, or music, or public speaking, or teaching, or taking care of others, or sorting, or finding patterns. But, whatever the activity, intrinsic motivation means you do it because you simply enjoy the activity itself and the feelings it conjures, rather than doing it for some type of reward or specific gain (and that actually includes avoiding guilt or receiving praise). There are also a few fundamental characteristics that tend to make something more intrinsically motivating. We enjoy a behavior more if it helps us feel more autonomous, if it helps us relate to and connect to others, or if it makes us feel like a competent person (which doesn’t mean that you don’t ever struggle with whatever it is you’re motivated to do. But rather, each small achievement you do make is so satisfying, it’s worth all the effort and tears you put into it). Oh sorry. Am I turning this into a lecture? I can get a little didactic when I get onto certain subjects – thankfully Joel does not hesitate to point this out as necessary to keep my dinner party acceptability level up! But, hey, I managed to leave my powerpoint slides tucked away in their file, so we haven’t gotten too academic yet, right? Anyhow, I was thinking about self determination and motivation as I was preparing these strawberries. I felt so happy as I sliced them up, smelled their roasting jammy sweetness, and whipped honey into goat cheese, I wanted to sing. I did sing. I sing to myself a lot. I almost always feel at least internally motivated to cook. I value cooking because I value good flavors, knowing where my food comes from, being able to eat healthfully, and sharing time with others over meals. But, on the best days, I value it for itself. Because it’s just fun to work with beautiful ingredients, and evocative scents, and to take an idea you have and actually see it through to a final product. That’s how I felt about these strawberries. I was thrilled with the idea when I had it, and then giddy with the results I achieved. I didn’t make them in order to be showered with compliments by those I served them to, though that did wind up happening. I didn’t even make them because I wanted a dessert that would be exceptionally delicious, fresh, and healthy, though that turned out to be the case. I did it just because it felt fun. The fun grows exponentially when I can share with others, however. Perhaps that fits in with the whole relatedness element of self determination. Getting to share them with you, I’m feeling the same bubbling overflow of effusiveness as a child who turned over a rock and found a fantastic colony of potato bugs and who then runs to fetch his friends so they can see too. It actually started with the goat cheese. One of the things I find most immensely satisfying in the whole world is eating whipped cream. It’s a rather indulgent habit, if I do say so myself, and one I have to curb with a firm hand, to avoid making spoon meets bowl of cream, meets mouth into a daily ritual. 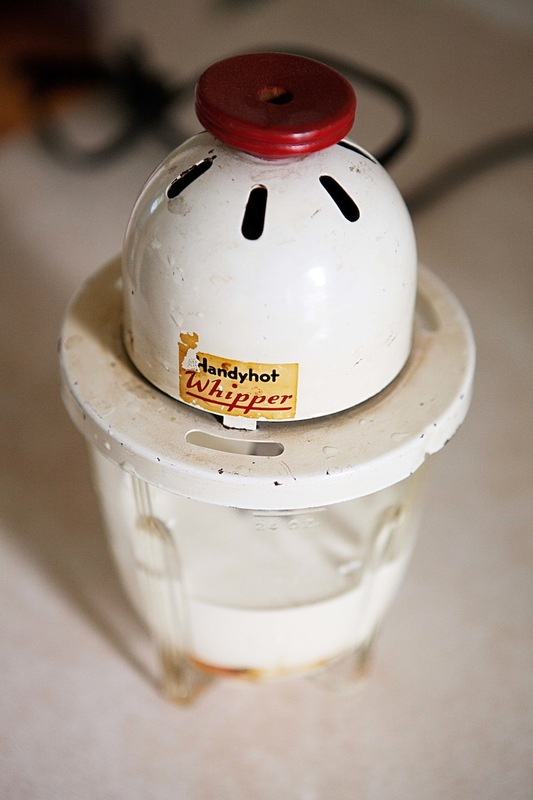 I love the sumptuous texture of cream and the airy fluffiness imparted by whipping. The other day, because of another project I’m working on, I wound up whipping together some cream, some sheep’s milk yogurt, and a sticky spoonful of honey. The alchemy of the three was magic. The richness of the cream was beautifully cut by the barnyard tang of the sheep’s milk, and the honey imparted a smooth liquid gold flavor and buttery prom corsage yellow color. It also made me wonder what it would be like with chevre instead of yogurt. I’ve enjoyed whipped chevre in many savory iterations, but no sweet ones. It was time to change that. Using chevre in the stead of yogurt made for a truly gorgeous bowl of lightly whipped snowy peaks. A sturdier texture, an even more pronounced citric tang, and I swear there was a hint of hay and violets. I licked the beaters with gusto, and stole a couple tastes with the crook of my finger. But, I decided, while I would gladly eat this chevre mixture on its own as a rather lavish mousse, it was giving me hard to ignore nudges in the direction of adding some stewy, soupy, lushly cooked fruit. Almost any fruit would do nicely, but we had strawberries, and they proved themselves an ideal match. The idea of roasting strawberries came from Heidi’s Super Natural Everyday, into the back of which is tucked a recipe for roasted berries with port wine and balsamic. Roasting the berries, rather than cooking them stovetop, gives you more concentrated berry flavor than you could possibly imagine being packed into a strawberry. And while the berries become soft and spoonable, they stay intact, rather than turning into a sauce, which gives you a lovely texture for eating. And the shining juices that accumulate in the baking pan thicken into a ruby colored syrup that tastes as fresh as fruit, not overly sweet. The juicy, bursting strawberries, in combination with the sweet whipped cheese are a match made in the most pastoral of heavens. They conjured up all sorts of childhood flavor memories of wandering through tranquil fields, along forest edges, collecting tiny sun-ripened strawberries and threading them onto long pieces of wild grass for carrying, and then eating later, one by one, using our lips to carefully pull them off. And then the reason for my utter giddiness dawned on me. Talk about connecting something to things I care about! Beauty, flavor, health, family memories, and now sharing with others. This dessert (or breakfast, if you wish, given that it’s pretty much fruit, cheese, and honey) seems to have it all. Preheat your oven to 325F. Line a baking sheet with parchment paper. 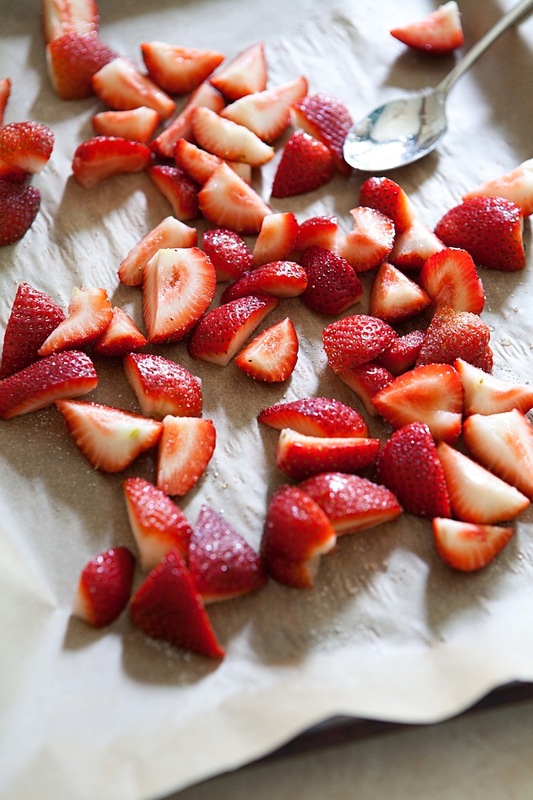 Then, toss the strawberries with a spoonful of sugar or maple syrup and spread them on the baking sheet. 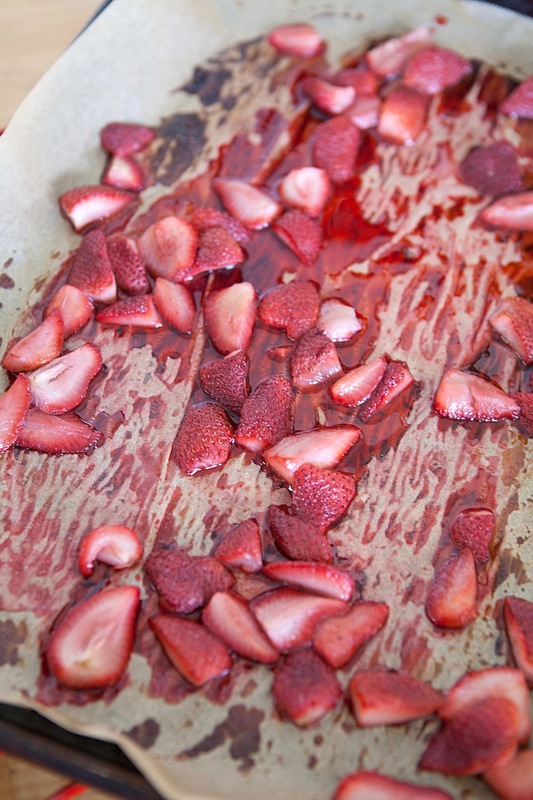 Roast them in the oven for 35-40 minutes, until the strawberries are totally soft and sweet and the juices have thickened, but aren’t burning. Remove from the oven, transfer to a bowl and stir in the vinegar. Use warm or cooled. 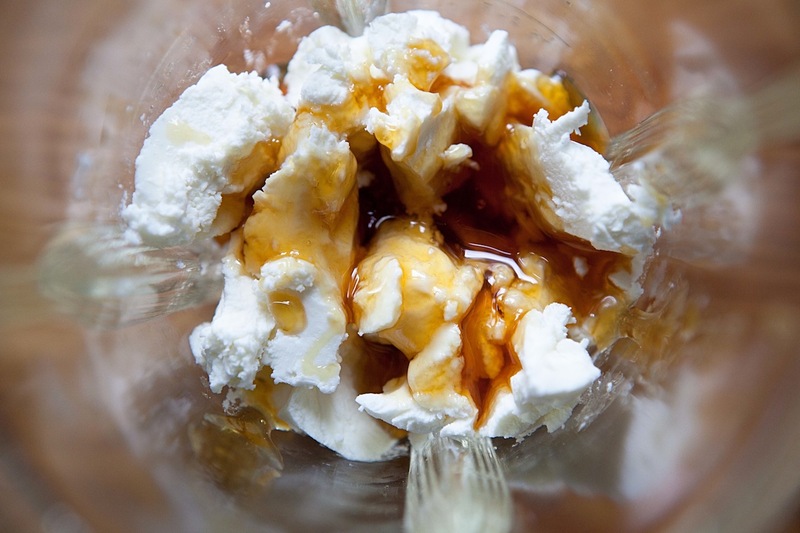 Combine the chevre, cream, and honey in a bowl. 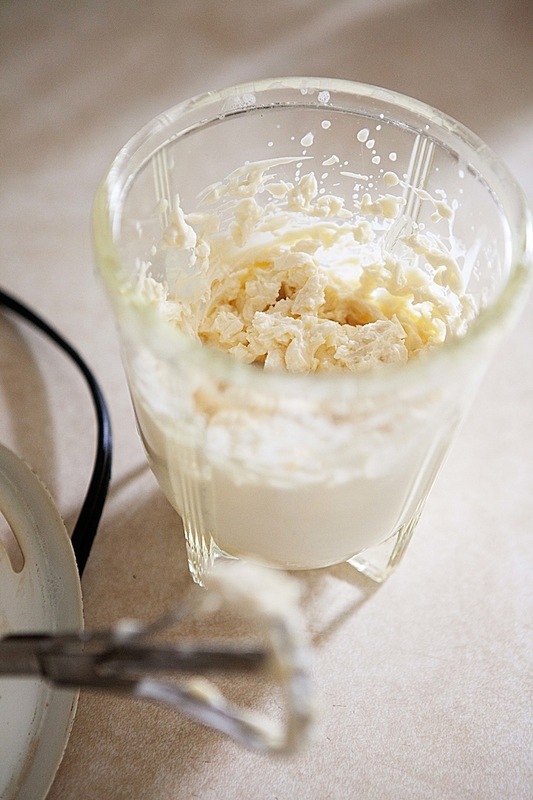 Using an electric mixer, whip until fluffy and stiff peaks form. 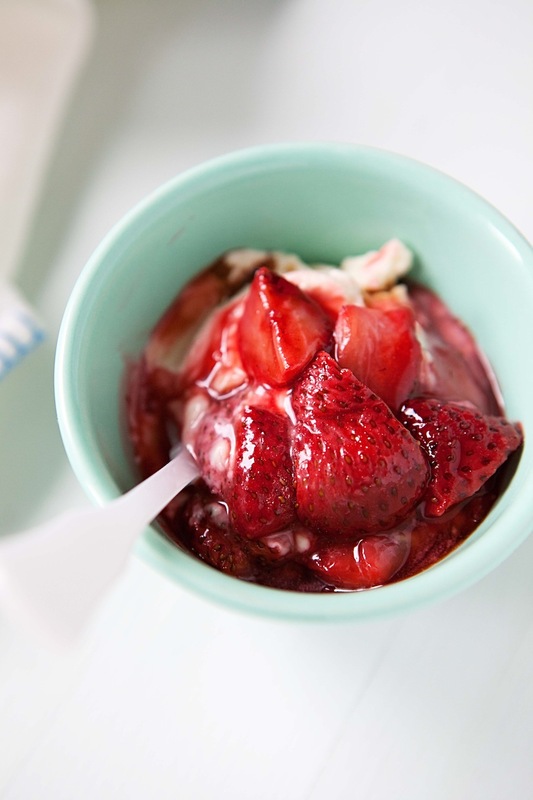 Divide the strawberries and the whipped chevre into four bowls, and serve. This looks absolutely perfect. I can’t wait for it to be strawberry season here. I’m bookmarking this and counting down the days! Thanks! I think it will be stunning with peak season strawberries! Absolutely beautiful post. Gorgeous pictures and beautiful writing. Must be an interesting course to teach. Thanks Robin! It’s a very interesting course. I especially love that the students find it incredibly applicable. Coming out of the ether to comment. Couldn’t resist such a shameless pander to my dual spring interests of behavior change theory and strawberries. Love your blog and often riff off your recipes. This one is in the cards after the farmer’s market this week. Miss you and all the Friedmanites! Your lecture sounds amazing! I would love to take that kind of course. I grew up in a family that wasn’t into the kind of cooking I was interested in. When I finally started cooking on my own, I was drawn to fresh and whole ingredients, not the processed foods I grew up on. I couldn’t really explain why. It sounds as though I may be intrinsically motivated to cook. 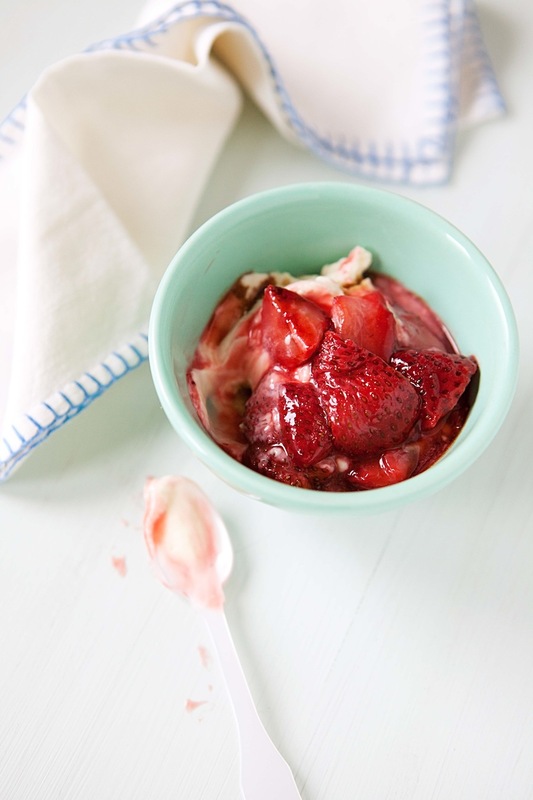 I am definitely making this recipe when strawberries show up at the farmer’s market. What a wonderful combination of ingredients! It does sound like you have the intrinsic motivation. What a neat story! I am completely fascinated with your lecture series! I wish I could sit in your class and soak up your wisdom. I work as a chef with an emphasis in nutritional therapy and I am always looking for methods to help my clients change how they feel about food and the unhealthy habits that have landed them in my company. It’s an extremely difficult task with some, but I have one client who has discovered the joy of cooking and actually cooks with me on his cook days. He “plays” with the recipe (as long as it meets his nutritional requirements) and feels so much joy from the task. He makes a much bigger disaster to clean up but he’s learned to “own” his food choices and has begun to change his palate. I seem to have gone on a bit long but I am terribly passionate about the subject and would love to hear more about your classes. Brilliant post Emily!! Thank you Karista! I didn’t realize there would be so much interest in these subjects, but now that I know there is, I’ll definitely try to share a bit more. Thanks for sharing the story about your student. It does sound like he made some of those personal connections that both made cooking matter enough to him to do it, and to find the fun and joy in it. I cannot wait to make this! If you’re feeling lazy Trader Joes has a good honey goat cheese that I imagine might be quite yum as well. I didn’t know that! Thanks for the tip. What a delightful read! And as one who has once again become internally motivated to lose a few pounds, I must say I am so going to try this recipe. Thanks a lot for your reminder how joyful cooking can be, especially when it comes to suche a simple and therefore delicious dessert! As I’m right now lacking of energy and motivation, your post is going to bring a change. Oh, best of luck to you with finding your energy and motivation again! When I need inspiration, I definitely like to start with just a few simple, really good ingredients to remind me of just how delicious simple can be. I also sometimes try grabbing something that I’ve never cooked with before, which can be inspiring. Thanks! Your compliment means so much to me! Talk about being intrinsically motivated to do something, even with lots of setbacks – I’ve been working doggedly on my photography for the last three years. Always trying to push myself to do better, studying composition and lighting and processing whenever I have a spare moment. There’s been a lot of frustration and tears (you don’t even want to see the photos on my earliest blog posts!) but I always knew I wanted to keep doing it, and it feels like it’s really starting to pay off. I’m just going to continue to push myself with it though. Thank you for the post and the recipe! It’s good to be reminded that it’s the connection between good habits and the activities we love, that can keep us on track if we remain aware of it. Great insight. And though I don’t intrinsically love cooking as you do, I felt the same excitement when I came up with a pumpkin soup recipe with Indian spices and coconut milk… so even kitchen doofuses like me can relate! I’ll try your strawberries tout de suite! Your soup sounds wonderful! No wonder it got you excited. 🙂 Keep it up! Just loved reading this, and gorgeous photo’s as well. It was refreshing to read this. What a great class you teach, working with what is already there first! Roasting is such a genius way of getting the best flavor out of most vegetables, it just makes sense with strawberries. Inspiring post and recipe! Thank you Paula. I’m glad you found it interesting and inspiring! You can lecture me anytime! Gorgeous photos and a great post! please get hooked up to Pinterest. I don’t see that you are and I really want to save/try some of your recipes, but like the organization of Pinterest. Hi Nancy, I’m not entirely sure I understand your request. You definitely ought to be able to pin any of my images to pinterest. I know many people do. Or, are you asking that I set up a pinterest board of my own images? I’ve been thinking about doing that, but absolutely haven’t really had the time to get to it. 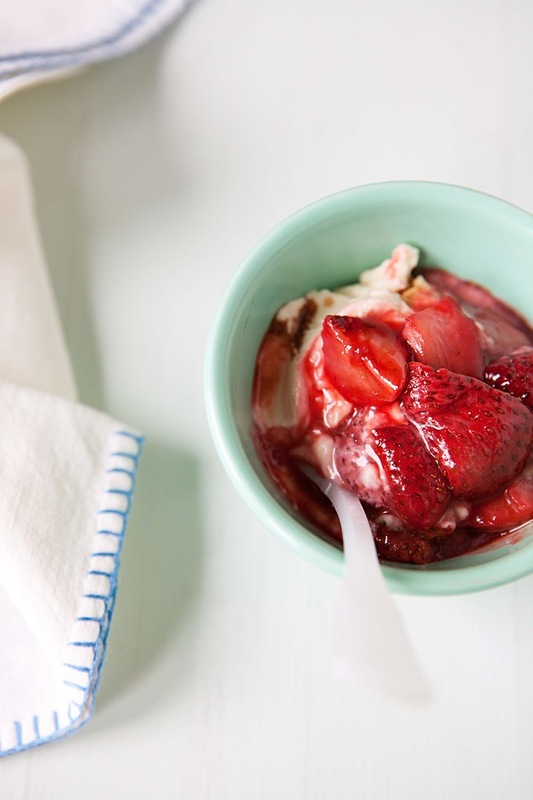 You are currently reading Roasted strawberries with whipped, honeyed chevre at Five And Spice.